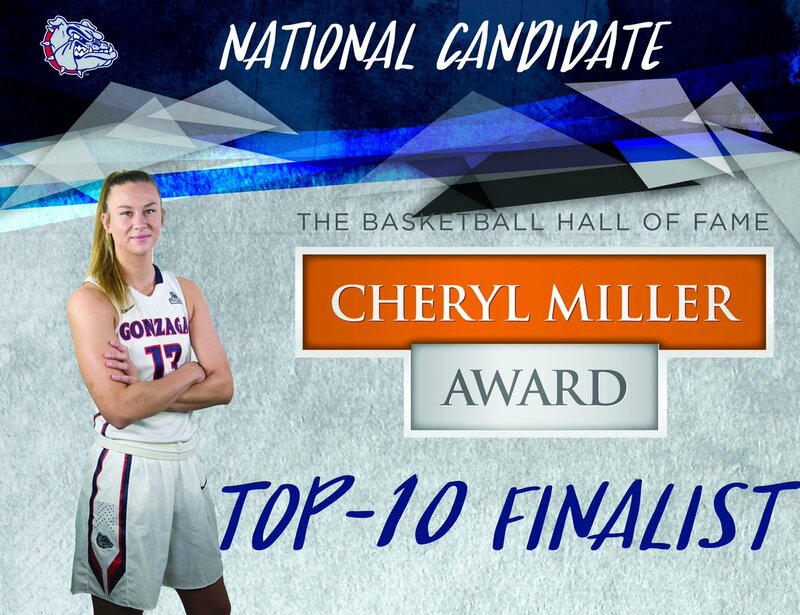 JB was named one of the TEN (10) national finalists for the Cheryl Miller National Award which recognizes the top small forwards in women’s NCAA Division I college basketball. SPRINGFIELD, MASS. – The Naismith Memorial Basketball Hall of Fame and the Women’s Basketball Coaches Association announced today that Jill Barta is one of the 10 candidates for the 2018 Cheryl Miller Award. Named after the three-time Naismith Player of the Year and 1995 inductee of the Naismith Memorial Basketball Hall of Fame, the annual award in its inaugural year recognizes the top small forwards in women’s NCAA Division I college basketball. The initial list of candidates was announced on November 8 with 20 total selections. Barta, a two-time First Team All-WCC and a WCC All-Freshman team selection, received her second-straight Preseason All-WCC nod this year. She has already been selected as the West Coast Conference Player of the Week three times and currently, Barta leads the Zags in points per game (18.5), rebounds per game (8.5), free throw percentage (.840), and double-doubles (8). She is second in the conference in points per game, fifth in rebounds, second in free throw percentage, fourth in field goal percentage (.494), and first in double-doubles. On the national level, she is 66th in points per game and 58th in free throw percentage. Barta is the only representative from the West region on the list. Shakayla Thomas | Florida St.
Bridget Carleton | Iowa St.
Congratulations Jill. An honor that is well earned and deserved. Zag On. Congrats, quite an honor. Top 10 lists for each of the positional awards have been coming out daily this week. It's a bit strange to see who is listed at which position. Doesn't Barta mostly play at the 4 position for GU? I know Gabby Williams from UConn doesn't play the 3 most of the time, she's an undersized 4 or 5 for them. JB plays both the #4 and #5 position (mostly #4) depending on our line-up but she rarely if ever plays the #3 spot.